Richard Feynman envisioned just this sort of manipulation at the very small scale in his visionary lecture, “There’s plenty of room at the bottom”, delivered at an American physical society meeting at Caltech on December 29th, 1959. This marked a turning point, spurring scientists on in their quest to explore the potential of nanotechnology. Seven years later, Richard Fleischer made the science fiction film, Fantastic Voyage, on a similar concept where a submarine crew shrink to microscopic size - using a technology that can miniaturise matter - and then venture into the body of a scientist to repair the damage done to his brain by a blood clot. Hitherto these ideas have remained very much a fantasy, until now. Currently, engineers and scientists the world over are trying to make various types of nanorobots for different purposes, and progress has been rapid. Although most of the outcomes are still at the laboratory stage of development, we hope very soon to see some of them used in clinical settings where patients will swallow, inhale and inject these nanorobots and doctors will use external guidance systems to direct them into diseased areas where they can perform discrete tasks, like sensing or delivering therapy while minimising damage to adjacent healthy tissue. 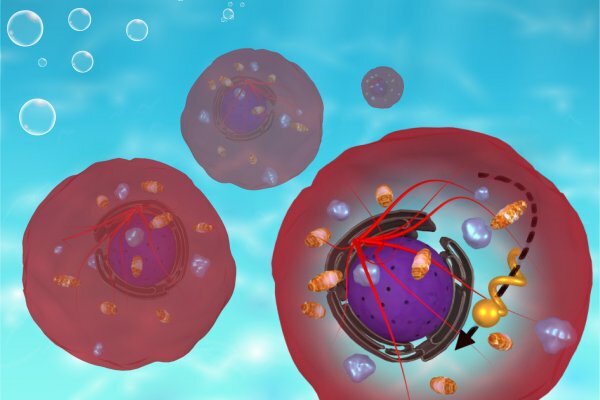 In some cases, it may even be possible to introduce and operate nanobots inside individual cells. However, creating a nanorobot that can navigate not only through tissues but also move around inside a living cell is not trivial. The intracellular environment is a highly heterogeneous space, packed with potential obstacles and obstructions. Previously, scientists had tried to manipulate gold nanorods inside cells, but they never succeeded in making them move in a controlled fashion. For this reason, our group at the Indian Institute of Science, Bangalore, used a different class of nanorobots - called nanomotors - to achieve this goal. Indeed, in a new study published recently in the journal Advanced Materials, we show that helical-shaped magnetic nanomotors can be manipulated inside living cells. To do this we use a technique called GLancing Angle Deposition (GLAD) to fabricate these helical shaped nanomotors. Then, a thin layer of magnetic material is deposited over the surface to make them magnetically active. These nanomotors can be remotely actuated by application of a rotating magnetic field, which is generated by a triaxial Helmholtz coil. As the rotating field is applied, the magnetic moment vector of the nanomotor tries to follow the direction of the field. This causes the nanomotor to rotate and, because of the rotation-translation coupling of the structure, it moves forward. The speed and direction of these motors can thus be manipulated with very high accuracy. In the present work, we have also developed a strategy to controllably manoeuver these nanomotors inside cells. This involves motion of a nanomotor until an obstacle is encountered, and then, by changing the sense of the rotation, we take it back slightly. Following this, the direction of the motor is changed by around 10 to 15 degrees and then it is moved onwards again towards its destination. Critically, these nanomotors can sense the viscosity of the surrounding medium by analysing the dynamics of the nanomotors. The nanomotors are also capable of delivering payloads with great speed and precision. Payloads can be captured by coupling the nanomotors using the process of plasmonics, a special kind of light-matter interaction. This technique allows selective pick-up, transport, release, and positioning of submicrometre objects, enabling us to carry out targeted drug delivery. In short, these tiny nanorobots have the potential to be a unique tool in future medical applications. Though these are very interesting achievements, there are many more challenges for future autonomous and non-invasive therapeutics. The main challenge is to image these nanomotors while they are moving deep inside a tissue, and our team has already started to develop ways to do this. Once this is sorted out, it will be possible to navigate along desired paths inside organs using external magnetic forces and, using the present technique, we can deliver the required drug to any specific location within the cell by sensing the local environment.